Monday - Friday: 10 a.m. - 9 p.m. | Saturday: 10 a.m. - 7 p.m. | Sunday 11 a.m. - 5 p.m. Welcome to Cork & Beans, a winery store and coffee shop located in Duck, NC. But this is not your ordinary store. 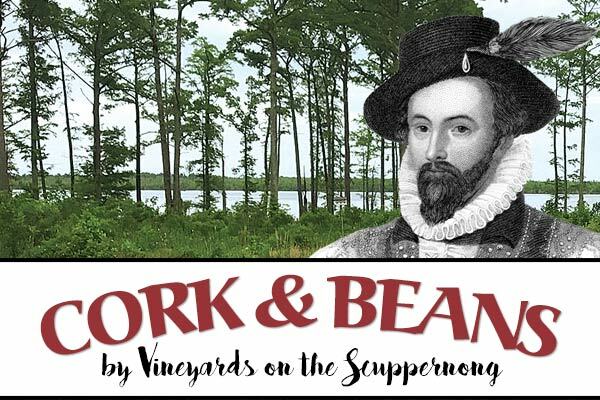 Cork & Beans IS the winery – proudly owned and operated by Vineyards on the Scuppernong. Visit us in Duck and enjoy our nearby vineyard without having to leave the Outer Banks. Sample our wines with a free tasting hosted by one of our experienced staff members, just as you would at the vineyard. Wine tastings are available daily, in-season. After your tasting, browse the store and grab bottles of your favorites. Our wines are hand crafted and award winning, and we can’t wait for you to try them! You’ll also find a variety of gourmet North Carolina food items, local art and other surprises. Venture over to the coffee side of our shop and enjoy all of your favorite hot and cold coffee and espresso beverages, including Nitro cold brew! We also offer fresh-squeezed lemonade, smoothies and a selection of freshly baked pastries. Coffee by the bag is available for you to take home, and we offer a selection of coffee cups, travel mugs and more. If you're looking for a winery in Duck NC, Cork & Beans is the next best thing. All of the wines carried at Cork & Beans are sourced from Vineyards on the Scuppernong. Located in Columbia, North Carolina, Vineyards on the Scuppernong is home to a wonderful selection of wines made from the world's healthiest grapes – grown, produced and bottled fresh right here in eastern North Carolina. To find out more about our vineyard and the history of the scuppernong grape, please visit Our Vineyard page. Cozy coffee shop and wine store featuring freshly baked pastries, local art and free wine tastings. Hot and cold coffee beverages, espresso, Nitro cold brew, smoothies, frappes, pastries and more. Wine, gourmet NC foods, local art, wine & coffee gifts and more. A coffee shop and wine store in one! Enjoy a free wine tasting or your favorite coffee beverage in a relaxing and enjoyable atmosphere. Browse the store for bottled wine, gourmet food, gifts and local art. Ask about our Vineyard River Tour!